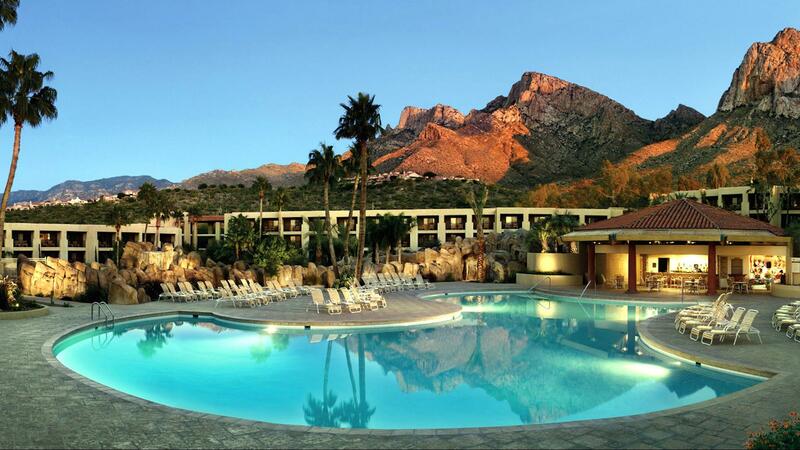 Rent Hilton Tucson El Conquistador Resort | Corporate Events | Wedding Locations, Event Spaces and Party Venues. Envision our beautifully landscaped garden settings nestled below the Santa Catalina Mountains with warm romantic hues to our casually elegant ballrooms & dining options, all paired with our experienced and dedicated service staff, The Hilton Tucson El Conquistador Golf & Tennis Resort is committed to creating your wedding day that is nothing less than impeccable & spectacular and as perfect and memorable as you always imagined it to be. The beautiful Pusch Ridge Course is located on the Hilton Tucson El Conquistador Golf & Tennis Resort property, and offers 9 Holes of scenic golf at the base of Pusch Ridge in the Santa Catalina Mountains. This Par 35 course features three sets of tees: Blue Tee 2,788 yards, White Tees 2,579 and Red Tees 2,322. A putting green and chipping green are available for practice and warm up.